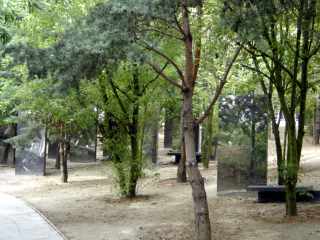 The Parc de la Villette, the Park of the Villette, was previously the site of slaughter-houses from 1860-1974. Between 1865-1866, architect Baltard built a uniformed style of slaughter-house which eventually replaced all other styles of slaughter-houses in the area. This area grew into a "city within a city", employing more than 12,000 butchers. The commerce and the activity that developed here began to attract all of Paris. 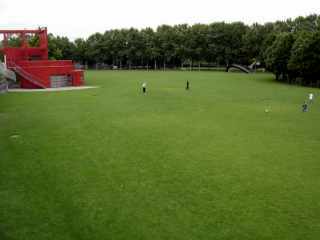 During 1982-1990, the 55 hectares occupied by the slaughter-houses was transformed into Parc de la Villette, designed by architect Bernard Tschumi. It is a unique park in a urban landscape. Of the 55 hectares, 35 hectares are open spaces, making this the largest park in Paris. 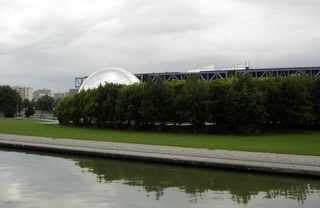 Among the 35 hectares of "green space" are 7 hectares of lawn.Parc de la Villette receives more than 10 million visitors per year. 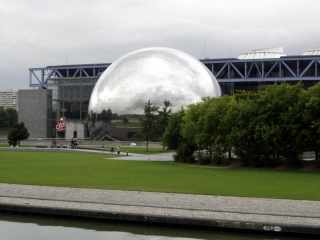 Within the Park is the Cité des Sciences et de l'Industrie, the City of Sciences and Industries, created by architect Alain Fainsilber, a spectacular, educational "hands-on" museum with permanent and temporary exhibitions concerning everything about science. It's a favorite of families and kids. 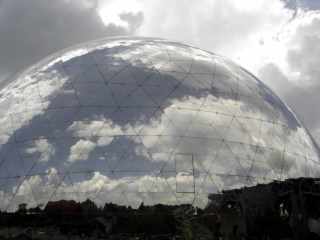 The Geode, designed by Adrien Fainsilber and Gérard Chamayou, houses a hemispherical movie screen of 1,000 square meters and shows films of nature and science specifically made for such a screen. 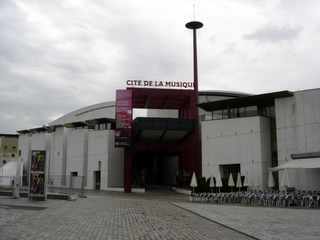 The Cité de la Musique, the City of Music, created by architect Christian de Portzamparc, is a museum of music and includes an auditorium, a resource center and a media library of music and dance. 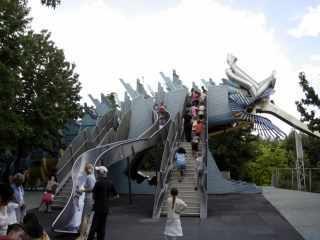 The Zenith, a nightclub offering musical concerts, designed by Philippe Chaix and Jean-Paul Morel, is also in the park. 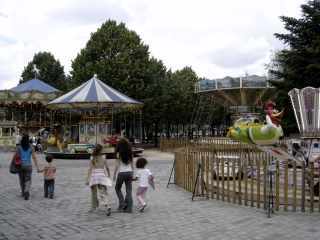 Parc de la Villette contains 10 theme gardens. The Garden of Mirrors, le Jardin des Miroirs, contains 28 free-standing mirrors set among woodland pines and maple trees. he Garden of Dunes offers a rolling landscape, pedal windmills and air-cushioned areas for children to expend lots of energy. 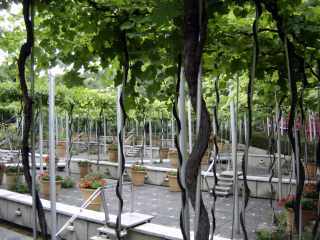 The Garden of Trellises, le Jardin de la Treille, includes 8 terraces of climbing vines with 90 bubbling fountains amongst them. There are also 7 bronze sculptures found here, created by Jean-Maw Albert. 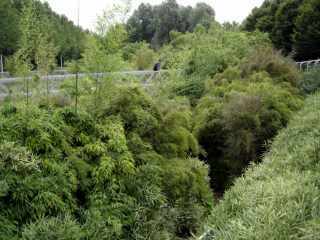 The Garden of Bamboo, le Jardin des Bambous, sits 6 meters below the rest of the Parc de la Villette. Several overhead walkways offer different views into this forest of bamboo, as well as a trail that winds through the garden below. A vertical, cylindrical water fountain created by Bernhard Leitner gives the sound of falling water to the area. 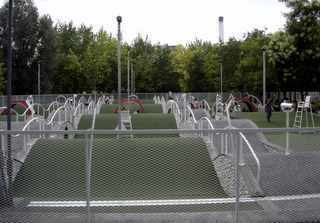 The Garden of Movement, the Jardin des Voltiges, is a play-area with different kinds of moving apparatus. The Garden of Islands, le Jardin des Isles, has a black and white marbled path which winds through oak trees, conifers and pines. The Garden of Balance, le Jardin des Equilibres, has metallic kites hovering like giant birds within the vegetation. 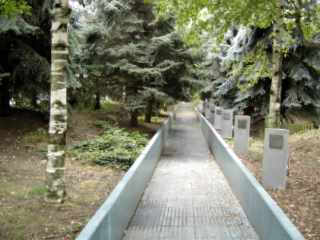 The Garden of Childhood Fears, le Jardin des Frayeurs Enfantines, has a walkway broadcasting eerie music as one crosses a forest of blue spruce and silver birch trees. 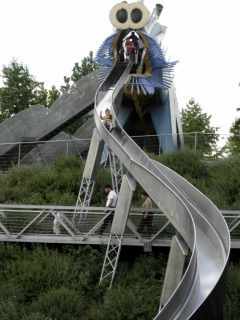 The Garden of the Dragon, le Jardin du Dragon, is a giant, 80 meter long climbing apparatus in the shape of a dragon with a long slide extending from its mouth. The park is divided by the Orucq canal. Boat rides on the canal are available. 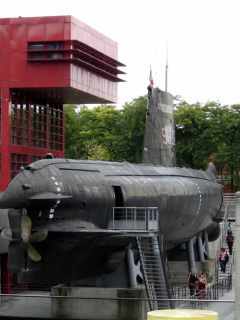 One of the more unusual features in this park is the Argonaut, a submarine, open to the public. The Argonaut has been around the world 10 times. 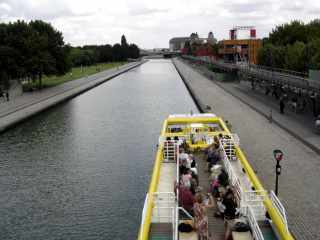 In 1989, it made its last voyage up the Orucq canal and anchored its 400 tons in the Parc de la Villette. Boarding the submarine is available during Tuesday-Friday from 10:30 a.m.-5:30 p.m. and on Saturday and Sunday from 11:00 a.m.-6:00 p.m. Entrance fee is 3 euros for all. Tickets are available only with a credit card. 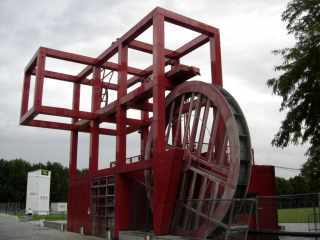 Scattered throughout the Parc de la Villette are a variety of red structures, some simply as decoration, others more utilitarian. These have become the signature architectural features of the park. 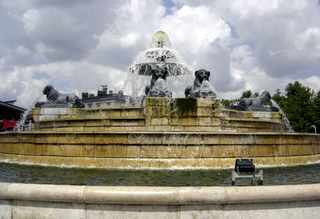 At the main entrance to Parc de la Villette is the Fontaine aux Lions, the Fountain of the Lions, created in 1811. It sits in front of the old tallow melting warehouse, built in 1867, what is now the Maison de la Villette, an Exposition Hall covering 1,130 square meters. Other buildings which have been preserved from the past are the police station and the post office and the Théâtre Paris-Villette, formerly the Pavillon de Bourse. During the sumer months the Parc de la Villette has presented big-screen outdoor cinema for the past 15 years, free of charge. Also, on every Sunday during the Summer, the Music Kiosk offers free concerts from 5:30 p.m.-9:00 p.m.
Parc de la Villette is an open park. There are no gates, no fences enclosing it. It is open every day, year round, with restricted access between 1 a.m. and 6 a.m.